In the early hours of the 27th of May, 1941, the German warship Bismarck - scourge of the Atlantic ocean - was sailing towards a fateful encounter. Two days previously, Prime Minister Winston Churchill had issued the order to "Sink the Bismarck". High winds and low visibility added to the atrocious morning weather as Fleet Air Arm pilot, John Moffat, took to the air in his open cockpit bomber. This is his story - of how as a young man he experienced first-hand the titanic struggle for naval supremacy, the cramped-cabins and meagre rations of WW2, the mind-numbing patrols over hundreds of miles of ocean and the adrenalin and fear of being in a fragile aircraft sought out by gunfire. 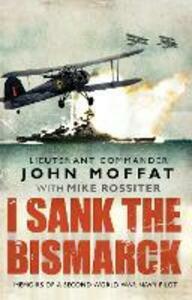 As the only surviving member of his fellow pilots, John Moffat tells of everything that led him to be able to say, "I sank the Bismarck".